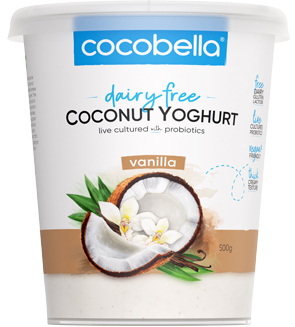 Cocobella coconut yoghurt is made with delicious coconut milk so it’s naturally dairy-free and vegan friendly. Coconut yoghurt (water, coconut milk, native starch, tapioca syrup, yoghurt cultures and probiotics), Vanilla blend (water, sugar, rice starch, natural flavour, vanilla bean (<1%), lemon juice concentrate). Bifidobacterium, L. acidophilus, L. bulgaricus, L. paracasei, S. thermophilus. Refrigerate below 4°C and consume within 5 days after opening. For Use By Date see side of pot. Made in Australia from 13% Australian ingredients.